A $700,000 Cizeta V-16T was seized in San Juan by U.S. Immigration and Customs Enforcement agents claiming it was violating multiple US import laws. Sadly, the car's one of the most interesting, and largely unknown, supercars in the world. The car was the fruit of efforts by Claudio Zampoli, an Orange County resident, who imported the car for claimed repairs. The car when new sold for $700,000 but was imported with a claimed value of $125,000 and stay in-country much longer than the year that was initially intended. Those issues together pushed Uncle Sam a little too hard and the car was seized and will be auctioned off. Far more interesting to us than the Mr. Zamopli's legal troubles is the Cizeta V16T itself. It was the initial design proposal for what became the Lamborghini Diablo, but Chrysler, who had control over Lamborghini at the time passed it over for a more conventional design. 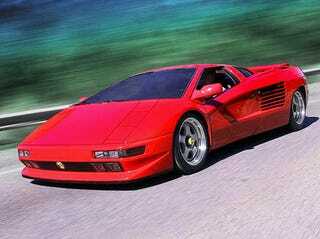 In essence, the Cizeta V16T is the Lamborghini that never was. The car's got a plethora of crazy features, most of which are in the engine bay, but the car surrounding the V16 is interesting as well. When everyone was moving away from flip-up headlights, the V16T brought quadruple flip-ups to the table. It also wears a rearward lifting clamshell engine cover. It's a built on a tube steel frame with aluminum body work, fully independent suspension vented disc brakes and it's sounding like pretty standard stuff right? Let's not tiptoe around what's under that rear hatch anymore. The V16 nestled sideways behind the driver is an all-original design and is basically two three-liter V8's smashed together with an output shaft coming out in the middle. The engine was an oversquare design with the bore and stroke measuring 86 x 64.5 mm respectively, and displacing 0.375 liters each resulting in a 9.3:1 compression ratio. It's got eight camshafts, but they're two per cylinder bank so it's still dual overhead cams, four valves per cylinder. The sucker's got two independent cooling systems for each side complete with two fans and two radiators, two throttle bodies two coil packs and so on. All that flyin' metal strangely only managed a somewhat modest but massive for the time 560 HP at a heady 8000 RPM and a less exciting 398 lb-ft of torque at 6000 RPM. It's hooked up to a somewhat traditional five speed manual transmission and the whole deal delivers a 0-60 MPH time of 4.4 seconds and a top speed of 203 MPH. The car first premiered at the 1989 LA Auto Show to the sound of one hand clapping, sales didn't go so well when production fired up following the production version debut at the 1991 Geneva Motor Show debut. Only about ten cars were delivered in 1992 and by 1995 production halted. The main reason most people know of it these days is its inclusion in Polyphony's Gran Turismo 4. It's most definitely seen more digital miles than real ones.